In the twenty-five years since Robert K. Greenleaf first articulated his vision of "servant-leadership," the world has seen a steady expansion in the influence of the man and his ideas. Hailed as the "grandfather" of the modern empowerment movement in business leadership, Greenleaf described true leaders as those who lead by serving others --empowering them to reach their full potential. He saw the ideal leader as one who transforms and integrates an organization; a steward with a commitment to the growth of people and the building of a community. Reflections on Leadership demonstrates the scope of Greenleaf's impact on contemporary management theory and offers key essays by Greenleaf and his leading business and intellectual disciples. They include such influential thinkers as M. Scott Peck, author of The Road Less Traveled, and Peter Senge, author of The Fifth Discipline. 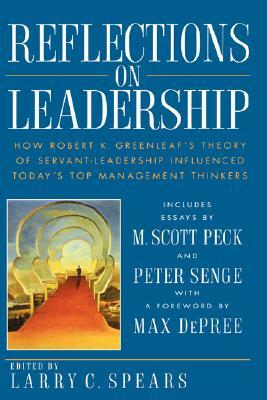 Reflections on Leadership opens with two remarkable essays by Greenleaf himself. One of them, "Reflections from Experience," published here for the first time, presents Greenleaf's prophetic observations on the use of executive power in an organization. In "Life's Choices and Markers," Greenleaf recounts five significant influences that led him to develop his revolutionary ideas on the nature of leadership. For those who have already benefited from Greenleaf's ideas and wish to deepen their understanding, this is an essential book. It is also the ideal introduction for those eager to draw on a source of wisdom that has inspired so many others. Author Name: Spears, Larry C.